Our third granddaughter is not a sit in the corner type. She is always in motion. On top of that being the third little girl in her family we are always struggling with gift ideas. The other two are not hard on things so they have lots of little girl toys. At two though she loves Elmo and his fish- Dorothy. So we decided to make her a fishing game. 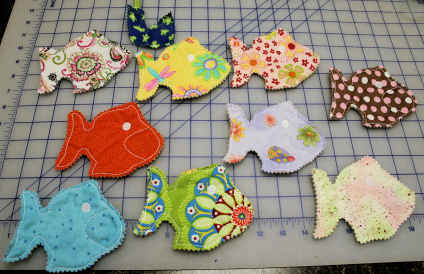 These in-the-hoop fish are very easy to make, using scraps of cotton and batting. Then we had to have a pond to fish from so we made one that would double for storage as well. 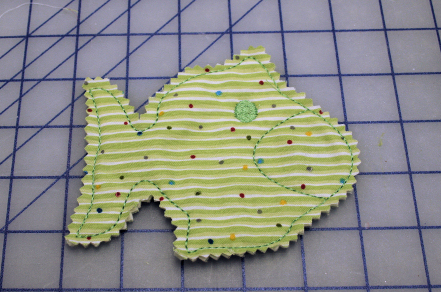 We will be happy to share our fish design for the 5X7 hoop at the end of the blog. 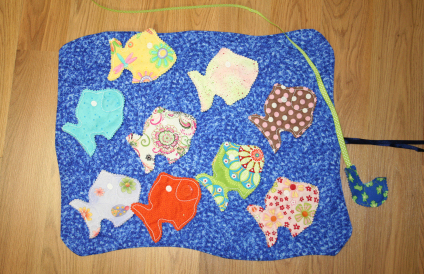 Fish design (fits in the 5x7 hoop) See below to download. 1. Hoop the batting in your 5x7 hoop. 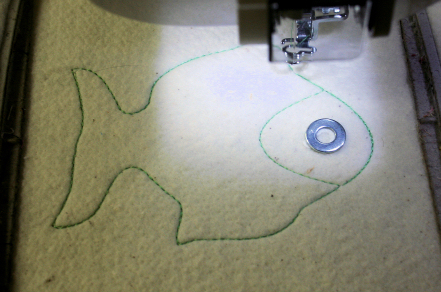 Slide on and embroider the first color of the fish design. 2. Center the washer inside the mouth area. 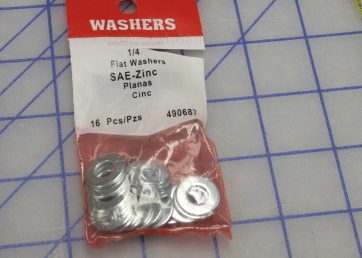 Important Note: Since not all machines are created equal; on the first fish; sew the first color again after placement of the washer and WATCH IT VERY CAREFULLY to be sure your foot and needle are clearing the washer all the way around. 3. 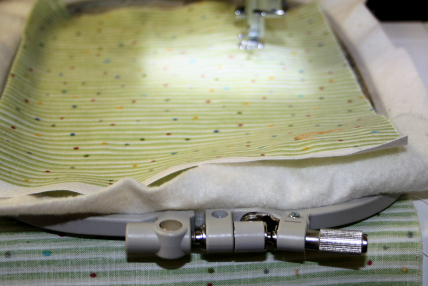 Remove the hoop from the machine.Using the lapel stick at the corners; adhere one fabric square to the bottom and one to the top of the batting. Make sure all of the stitching is covered and that both fabrics are face out. 4. 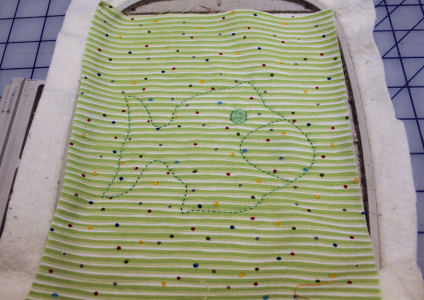 Carefully slide the hoop back on the machine and sew the rest of the design. Remove from the hoop and pink around the fish. That's it. Make enough to fill your pond. Download the fish design here. For the pond rectangles the size I wanted for the pond. Then I cut again in a slightly abstract pond shape. Then I used a long 1/4" ribbon. 1. Lay one abstract shape face up on the table. 2. Fold the ribbon so that one "half" is several inches longer than the other. Pin the fold at the top of the abstract rectangle and lay the lengths are down on the fabric. Pin at the fold. 3. Lay the second abstract rectangle face down on top. Match and pin edges through all fabric. Make sure the ribbon is inside the sandwich and not near the edges. 4. 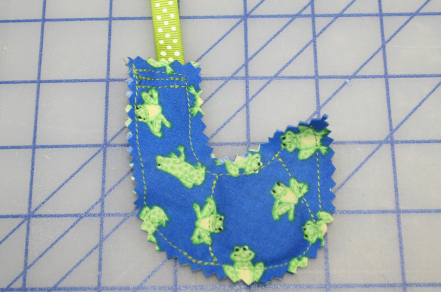 Sew around the shape leaving a 3 - 4" opening along one upper side for turning. Turn right side out. Sew the opening closed. Put your fish in the pond and play. When done fold the pond around the fish and tie. For the hook I just used ribbon and a hand-drawn hook making sure it was large enough to sew around once the magnet was inserted. 1.Cut two hooks from cotton and two from thin batting. 2. Layer one fabric face down. 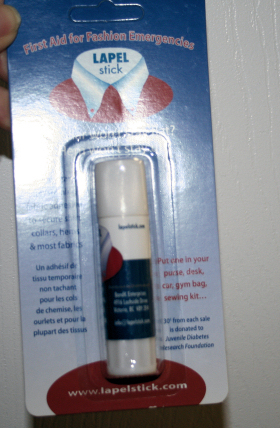 Then one batting, then glue the magnet as desired. Next another batting layer and then the second fabric face up. 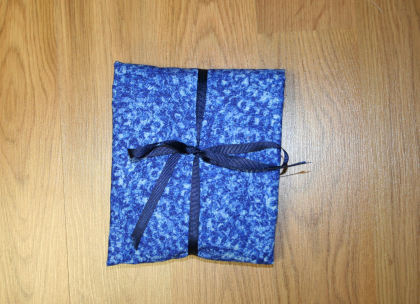 Insert the ribbon end into the middle top and sew around the whole thing being mindful of the magnet. Then I sewed on each side of the magnet to be sure it stayed in place. Pink around the hook beign careful not to cut the ribbon off. Our granddaughter is two and she (as well as her older sisters) has had a lot of fun playing this game. For an educational twist you could use Alphabet Xpress to add numbers or letters to the fish. I wish I would have thought of this before I made the game. Until next time, have fun with your embroidery. Great Idea! I have a lot of grandchildren, and they will love this game. How adorable! Fun. Portable. Easy to store. Thanks for the free design!